David Abernethy, M.D. is the founder and producer of Puddingstone. He received his early music training as a percussionist with the award winning Lenoir High School Band. As a student of Science at Elon College, he simultaneously held a full music scholarship, and traveled with the school stage band. He earned a B.S. in Chemistry at Elon College and an M.D. degree at Bowman Grey School of Medicine. He plays the hammered dulcimer, hurdy-gurdy, penny whistle, gemshorn, krumhorn, recorder, rackett, electronic wind-controller, and many percussion instruments. When not directing Puddingstone, David practices medicine in Lenoir, N.C. He also enjoys sailing, sawmilling, farming, and caring for the many animals who live on the Abernethy farm. Mike Willis discovered an early interest in a musical career as a percussionist with the award winning Lenoir High School Band. He studied at Brevard and at ASU in Boone, NC. He has extensive experience playing professionally with a variety of musical groups. He played percussion with the New York Quartet and with the Jerry Lambert Trio in Charlotte, Raleigh and Atlanta. His unique style of jazz piano developed while working with Milton Clapp with the New York Quartet. He studied harp with Jean Morehead in Raleigh and Lorraine Little in Charlotte. He played harp and piano at the Esseola Lodge in Linville from 1982-87. He played harp and piano at the Tower Club in Charlotte from 1989-96, and does freelance work with several musical groups in the area. Mike has a lifelong interest in fitness and sports and is a fair weather motorcyclist. Denise Baxter-Yoder began singing in church choirs at the age of five. Born to Air Force parents, she has lived and traveled extensively throughout the U.S. She holds a degree in music from Montevallo University, AL, and a Master's degree in Education from ASU, NC. She is a former public school sixth grade teacherwith Catawba County Schools, is a singer/songwriter, has performed in musical theater with her husband, Chuck Yoder, and likes to paint, create jewelry and hand-knit items. She maintains two small store booths where she sells handpainted furniture, pictures and handknit items. 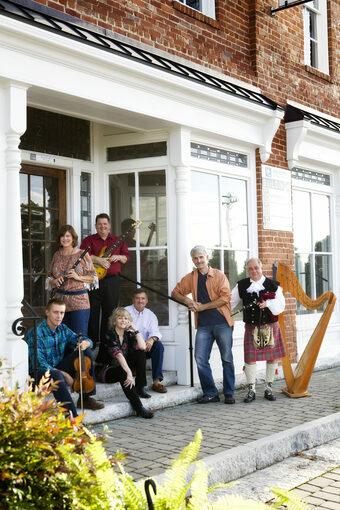 Her newest passion is the Celtic harp, which she performs with Tapestry, a harp, flute and cello ensemble. Gregory started playing the piano when he was four. At eleven, he began studying at Lenoir-Rhyne College under Dr. Thelma Rast, with whom he continued until his graduation in 1983 with a Bachelor of Arts in piano performance. While in college, Gregory was a recipient of the Hickory Music Club Award, as well as the winner of an eight-state concerto competition. Gregory was selected as a finalist in the 2016 Van Cliburn International Piano Competition for Outstanding Amateurs, where he was also awarded the Creative Programming Award. Also in 2016, the city of Lenoir, North Carolina, presented Gregory with a Pinnacle Award for lifetime achievement in music. In October 2016, Gregory was invited by WDAV to perform and record on Van Cliburn's own personal piano, CD 375. In March, 2017, Gregory was invited to perform an all-Chopin recital at the Gasteig Performance Center in Munich, Germany as part of the Mein Pianoforte Pianomarathon Internationaler Meisteramateure festival. Gregory has performed in Bass Performance Hall and Van Cliburn Recital Hall in Fort Worth, Texas, and as guest soloist with the Fort Worth Symphony and the Western Piedmont Symphony. In addition, he performs regularly with a variety of local musical groups, including Puddingstone and the Caldwell Men’s Chorus. He has appeared extensively over the years with choral groups, schools, stage shows, and various other soloists and musical groups. In October 2014, Gregory was featured on American Public Media’s Performance Today, the most-listened-to classical music radio show in America, reaching over 1.4 million listeners each week. His performances have also been broadcast on WDAV’s Carolina Live program. Paul Holt has been playing guitar since age 15. He had his first group experience with a rock and roll band in high school. He received his Bachelors and Masters Degrees in Guitar from ASU in Boone, NC. Paul has two daughters and one son. Both of his daughters plays piano and one daughter plays guitar and his son also plays guitar. Paul teaches at the Suzuki School of the Arts in Hickory, NC. He has about 60 students from age 4 to adult. In addition to playing guitar with Puddingstone, Paul also plays electric guitar in church with the praise and worship band. Suzanne Williams is the manager for Puddingstone. She started playing the flute at age 12 in her sixth grade band. She studied music at Stetson University where she became a student of Geoffrey Gilbert. In 1989 she moved to Hickory, NC with her husband Todd and children Jay, Laurie and Jack. She teaches flute and is also a Realtor with Coldwell Banker. Suzanne enjoys performing as a member of Tapestry, a harp and flute ensemble, Down the Hall, a contra dance band, has performed with the Western Piedmont Symphony and Chamber Orchestra and freelances for weddings, parties, churches and community events. Silver flute, Irish flute, recorder, whistle, gemshorn and fife are among the instruments she plays in the group. In addition to music she enjoys traveling, reading, learning claw hammer banjo and collecting vintage clothing. Matthew Davis grew up in Lenoir, North Carolina and has recently moved to Boone, North Carolina. He is currently attending Appalachian State University, majoring in a Bachelor Degree of Music in Violin Performance under the instruction of Dr. Nancy Bargerstock. He has been studying the violin since the age of 8. Matthew has been very involved in the Caldwell community. He joined the Caldwell Men’s Chorus, four years ago, as a second tenor. He has also played the violin for the Caldwell Men’s Chorus. and the musical, The Fiddler on the Roof. He has attended summer music camps and won scholarships. He has played with Puddingstone for three years and hopes for many more to come. Matthew enjoys playing for nursing and resting homes, hospital events, schools, churches, weddings, and other events. Aside from his violin life, Matthew enjoys spending time with family and friends, being outside, and being involved with other types of music as well. He enjoys sharing his love of music with his community and looks forward to what the future holds for him and the violin.